This is a fragment of a story published by Abraham Mahshie who we had the privilege to assist on his Genealogy Tour last year. This year, Abraham returns to Poland and Lithuania with his Polish-American mother to introduce her to the family he rediscovered after 67 years. Ojcze Nasz. 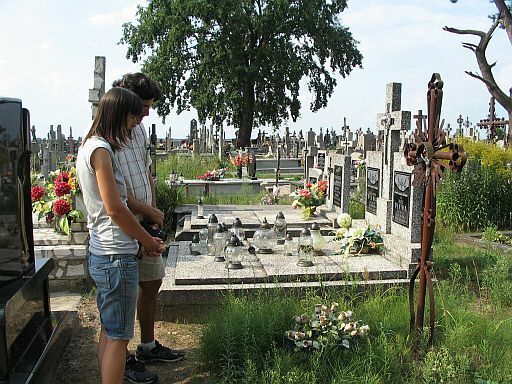 The “Our Father prayer” with newly-found cousin by our common great great grandparents’ grave. Click on the picture to listen to the prayer. We knocked and an old woman answered the door. ‘Is this where Boleslaw Jadczuk lived’ Zenon asked. Did he have a brother named Ludwik who immigrated to America? On a Sunday in August I drove to a farming village in Eastern Poland where I believed my ancestors lived more than 100 years ago. I was led there by the elegantly inked words in a 67-year-old Polish letter that belonged to my great-grandfather, Ludwik Jadczuk, who had immigrated to America in 1913. The only clues to my family’s whereabouts were in the letter written by Ludwik’s brother. It began, Village of Kamianka, 3 August 1947. Read the rest of the story by Abraham published on ozy.com: http://www.ozy.com/t%E2%80%A6/looking-for-great-grandpa-ludwik/37435 . Bonus (not available with the original article). Listen to the audio recordings made by Abraham of some of the conversations we had and stories told by his newly found family! 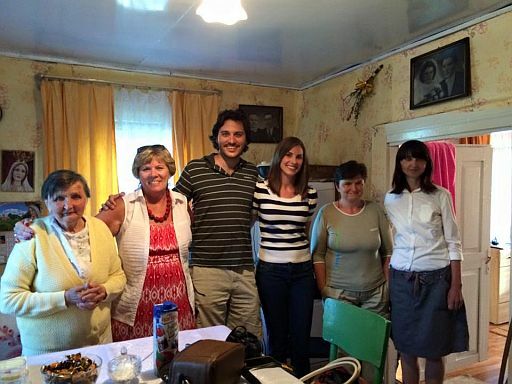 Update: In 2015 Abraham returns to Poland and Lithuania with his mom and they together discover even more family! You can read about it and watch many pictures here: https://blog.polishorigins.com/2016/01/21/looking-for-great-grandpa-ludwik-part-2-we-return-with-mom-to-discover-even-more/.